…. but it should not be forgotten that its eastern slopes are primarily drained by a rivulet that emerges from Oxleas Wood, flows under the main road near the “We Anchor in Hope”, divides Plumstead Common from Bostall Hill and enters the Thames through the Plumstead Marshes. 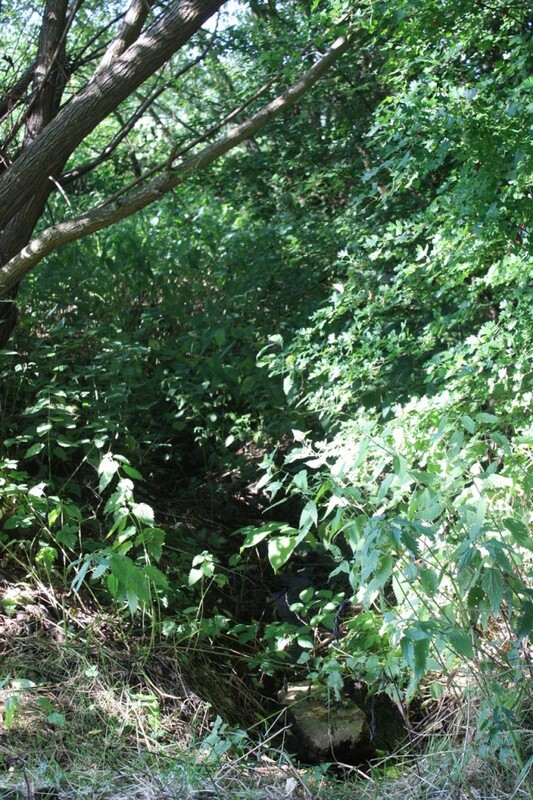 This rivulet is often alluded to as the Plumstead River, but researches made by the late W.H. Many, in 14th century manuscripts, have shown that its ancient name was the Wogebourne or Woghbourne. It is said to have originally been a tidal river. An aside in the first of Colonel Bagnold‘s articles about Shooters Hill set me off on a search for the course of the ancient river Wogebourne, from its Shooters Hill sources to its disappearance in Abbey Wood. Where had the Wogebourne run? W.T. Vincent called it the Plumstead River, and also “An Obsolete River” which had disappeared. Its course is shown in the sixteenth century map from his Records of the Woolwich District, right. He said that it flowed “from the Halfway House, near Crossness Point up the Wickham Lane Valley, a short branch diverging eastward to the point where the abbey of Lessness stood (near Abbey Wood Station), and the other stretching past the eastern foot of Shooters Hill through Well-end (Welling) to Eltham.” He also mentions that it was connected to the “Great Breache”. Vincent’s map is interesting, but not very useful in finding where exactly the Wogebourne used to run. It took a trip to the Greenwich Heritage Centre to find a more detailed map in one of their drawers of fascinating old maps. 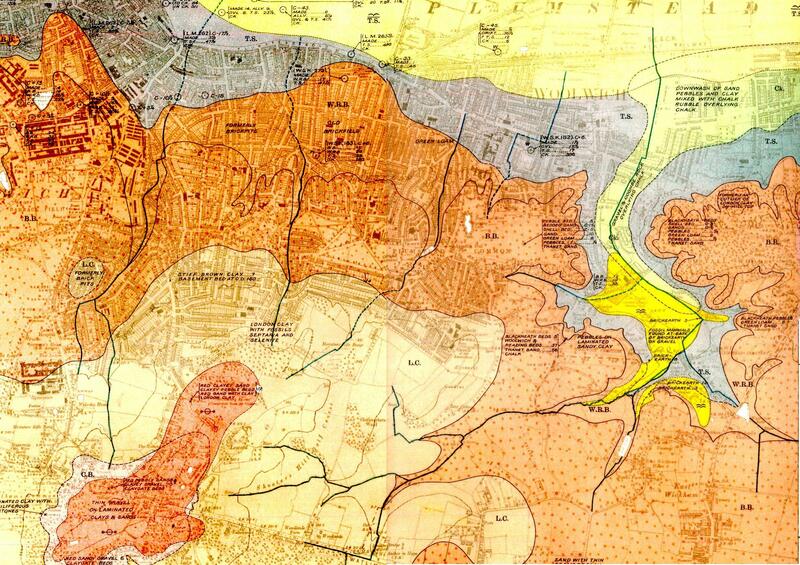 It was a beautiful, coloured map of the 1920 edition of the Geological Survey of England and Wales. A scan of the relevant part is shown below. It doesn’t include much of Oxleas Wood, but shows branches of the river starting in Shooters Hill Golf Course and Woodlands Farm. It also shows the branch crossing Shooters Hill from Oxleas near the We Anchor in Hope pub. 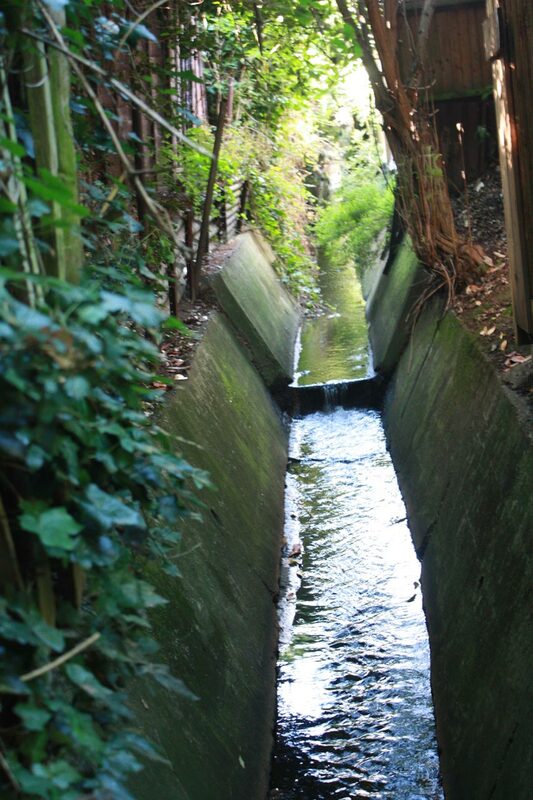 After flowing through the farm the river passes through Bourne Spring Wood south of Woolwich Cemetery and turns sharply to the North when it meets Bostall Hill, down the Wickham Lane valley. Armed with my old OS Explorer Greenwich and Gravesend map, and some print outs from Nokia Maps showing water courses I headed out to see where the river flowed. Two streams are marked as flowing down the eastern hill of Oxleas Wood, though they are both dry ditches at the moment. 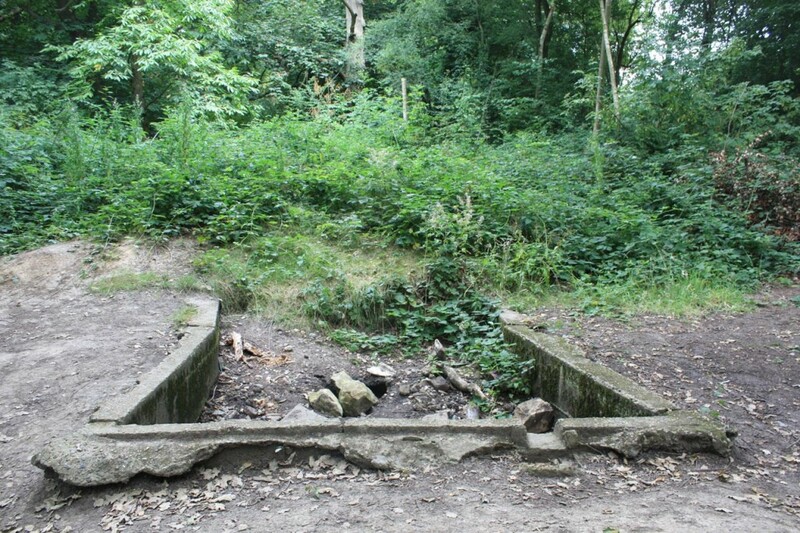 The origin of one of them appears to be just up the hill from the concrete structure pictured at the top, which is shown as a “tank” in the grounds of the old Falconwood House on the 1914 OS map. Possibly a receptacle for spring water? The southernmost of the two branches in Shooters Hill Golf Course is pictured in my previous post about Shooters Hill Springs. It’s quite easy to find where the Wogebourne crosses Shooters Hill, and it can be seen over the fence at the side of the petrol station. It runs as a proper stream though Woodlands Farm, albeit with very overgrown banks, and leaves the farm at Swingate Wood near the (locked) Keats/Dryden Road gate. From there a ditch runs along the edge of the Teviot Rangers JFC sports field, then behind some houses before disappearing under the Glenmore Arms pub. The river must run underground across East Wickham Open Space. My Explorer map shows a streak of blue behind the houses in Bournewood Road – built where Bourne Spring Wood used to be – but it was difficult to see a ditch behind the brambles. The point where it reappears on the east side of Wickham Lane is quite clear however, just a peer over a wall, and the water is flowing strongly along a stone lined channel at this point. That distinctive right angled turn to the north shown on the map is still there, though you have to risk a tree-root assisted scramble down a steep clay cliff in Bostall Wood, not too far from Turpin’s Cave, to see it. That view of the stream running along the edge of Bostall Woods is the last I saw of the old river, and I assume it continues underground into the drainage system for the Thames-side marshes. My Explorer map has more streaks of blue running between the back gardens of Bendmore Avenue and Woodhurst Road down to the railway line, but there is nothing to see there now. 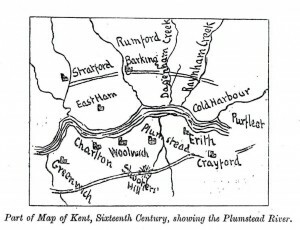 On the 1920 geological map the river disappears into Plumstead Marsh. 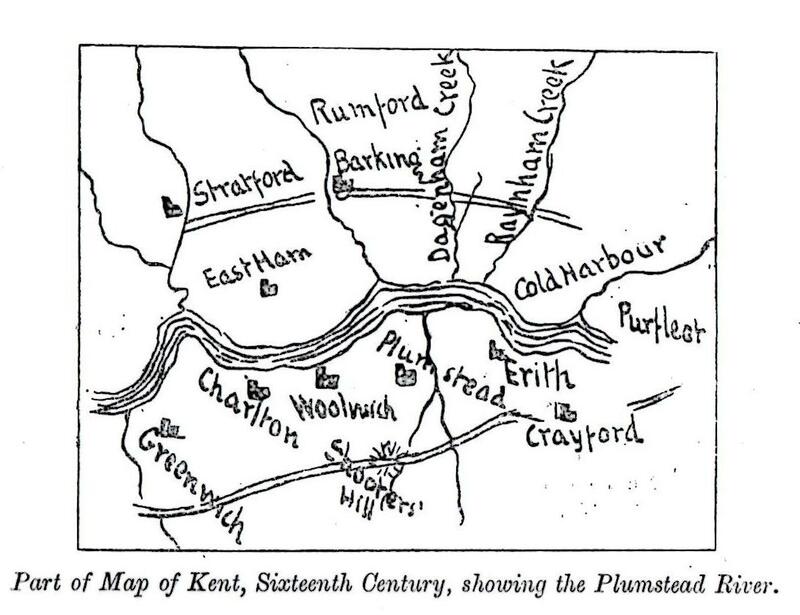 Vincent said that it connected to the “Great Breache”, an incursion from the Thames near Crossness in 1531 which is shown in a map in ‘Piteous and Grievous sights’: The Thames Marshes at the Close of the Middle Ages by James A. Galloway. The Great Breach is now part of Crossness Nature Reserve. It was also included in the long list of land and properties to be compulsorily purchased for the East Thames River Crossing in 1991. It may seem strange, but I’m actually looking forward to some rainy weather so I can see some of the ditches and holes I’ve been peering into in action. Thanks George. The Open Street Map looks good – not many on-line maps, e.g. Google, include water courses, and it’s really useful to have the footpaths mapped too. You seem to have most of it covered, but I’ll check if I’ve got anything new. I do enjoy finding out about my area – well done Hilly for all your research and for sharing what you find! I grew up in Abbey Wood and can remember when the section of the river between Bendmore Avenue and Woodhurst Road was open, back in the 1950s and 1960s. Of course that’s a long time ago now, but it was similar to the Woodbrook Road section in your photo. The pathway between the two roads – opposite Cassilda Road – is now paved and landscaped, but then it was a rough gravel track covering the same area and the river passed beneath, presumably in some sort of culvert. I think the river was put into a pipe and covered over sometime in the 1970s but definitely no later than 1982. There are now garages behind the houses in Bendmore Avenue and Woodhurst Road, but the access way, over the now-buried river, is extremely narrow and doesn’t give much room to manoeuvre. I think that the course of the Wogebourne would cross Bracondale Road between Woodhurst Road and Brinkburn Close. The properties there date from the late 1950s, so presumably the river was covered over then. Prior to that, I remember wooden huts on the site in the early 1950s. I guess they were a temporary expedient to cover post-war housing shortages. I’ve just had a look on Google Streetview to refresh my memory and I believe there is some evidence of the course of this river in Blithdale Road. There is quite a gap between numbers 82 and 84 (south side of the road) and the concrete wall between them is more substantial and different in style from the adjacent garden walls. It is mirrored by a similar wall on the opposite side of the road, which again does not fit in with the relatively more modern properties either side. I think this is where the river passed under Blithdale Road and the concrete walls are some sort of parapets. I have now spoken to my sister and compared recollections of the stretch between Bendmore Avenue and Woodhurst Road. The open section ran from Cassilda Road towards Manton Road. South of Cassilda Road, the river was underground. So the garages were there before the river was covered. The properties here were built in the 1930s. In Manton Road, gaps in the houses on either side of the road mark the course of the river.